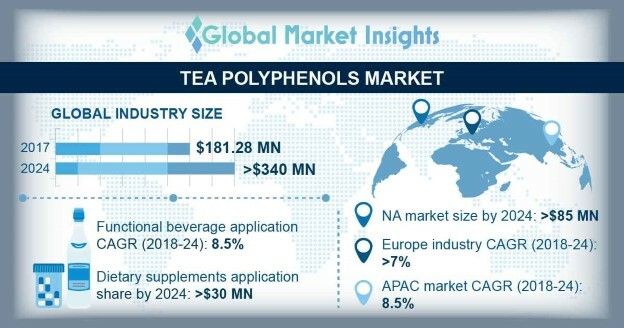 Tea Polyphenols Market size is set to exceed USD 340 million by 2024; according to a new research report by Global Market Insights, Inc.
Increasing consumption rates along with rising health awareness for nutraceutical food & beverages will propel tea polyphenols demand. This growing demand can be ascribed to its nutritive benefits and unique flavor with its flexibility to be incorporated in wide range of food and beverage products. It is also rich in antioxidant and EGCG (epigallocatechin gallate) component, thus boosting global demand. Global tea polyphenol market from direct selling distribution is predicted to witness significant gains at over 6% during estimated timeframe. Sellers’ market the product in numerous ways including incorporating them in diverse food and beverage products owing to attract different strata of consumers. Acceptance of tea polyphenols owing to rising youth population and their purchasing power contributes to a major share in sales. It is usually consumed as a beverage though the product is also incorporated into snacks and cookies, thus driving market growth. Higher prices of green tea polyphenols compared to other beverages including oolong and black tea with little buyer awareness towards product might hinder industry growth. Other restrictive factors include high production cost incurred owing to environmental and transportation with being a labor-intensive industry. This can be overpowered by increasing capital by industry players to expand their product portfolio. Green tea polyphenols industry size from cosmetic application may observe gains up to 6.5% in the estimated timeframe. Global organic cosmetic industry was valued at 12.5 billion in 2017 and is expected to grow at 7%. The extracts are utilized in cosmetic products due to its antioxidant abilities for detoxifying from free radicals and treating dull & dry skin. Changing preferences of consumers for organic toner, moistures, and face serums would drive tea extract product demand. Global oolong tea polyphenols industry size is projected to exceed USD 60 million in the estimated timeframe. The growth can be attributed to product and utilization in niche application followed by high product pricing. It is considered of fine quality due to its semi-fermented nature. It contains EGCG, L-theanine which reduces risk of cancer due to its antioxidant properties, thus boosting industry size. U.S. green tea polyphenols industry size is projected to exceed USD 30 million in the forecast timeframe. Consumers utilize the product in functional foods owing to low calories. High buyer acceptability towards organic products and connected health benefits would upsurge regional industry size. Global tea polyphenols industry share is competitive and consolidated with major industry participants including Shaanxi Dongyu Tea Co, Ajinomoto OmniChem Natural Specialty, Arjuna Naturals, Chengdu Wagott Bio-Tech Co., Berkem and DuPont-Danisco. Manufacturers make heavy investments in R&D to enhance their product offerings. They are also coming into long-term contracts with raw material suppliers for easy sourcing of the product.